One condition of being free is to be able to act alone. In Rouge, the eight performers, all young, all male, have no freedom, their actions watched by the group and performed under a collective duress. Later this will drive them to desperate ends, but at the start there is only a heavy sense of suspicion and distrust. Laying down bamboo staves to form an arena, they move as a group to patrol its circumference. As they circle in a tight pack, one boy appears from behind their mass, stood on his hands; the others stare out, he must return, and the sequence is repeated with others leaving and returning under scrutiny. The performers then spread out across the stage, each standing alone, and slowly turn heads to look at one, just one, of their number. It's not clear where the collective gaze will fall until the final moment. All that's clear is that no one can look at themselves. Rouge is the creation of Phare Ponleu Selpak, an art school in Battambang, Cambodia that began as a refugee camp teaching art and creative expression to young people who had fled the country's conflicts. Made in collaboration with the French group Compagnie Ubi, it's a stark and powerful production, remembering the violence of the Khmer Rouge regime, and the militarisation of adolescent youth, in a simple, pared-down dramaturgy. The bamboo sticks are the only props, wielded or else stood on end to represent the trees of a jungle; the acrobatics are mostly neither literal nor exactly figurative, contributing instead to a muscular sense of barely contained physical threat; and the live music is a two-piece band playing harsh gong, gamelan, and surprisingly, though not inappropriately, electric guitar. Within this basic staging, however, a complex, knotted feeling begins to take shape, arising not just from the knowledge that Rouge's images of torture and murder are real memories (if not for the performers, then for many others), but also from the attempt to reconcile that violence with the dreamy and oblique and horribly recognisable connection the piece evokes to the universal condition of being a teenager. Everything is there, in gross, unreal excess. Normalisation, aggression, shame, the internalisation of authority, the dreaded weight of peer attention, judgement by appearance. There's little hierarchy among the group, but one performer begins to be singled out, and as the piece accelerates it slips into an individual, yet nameless, narrative. The final scene attains a high intensity. 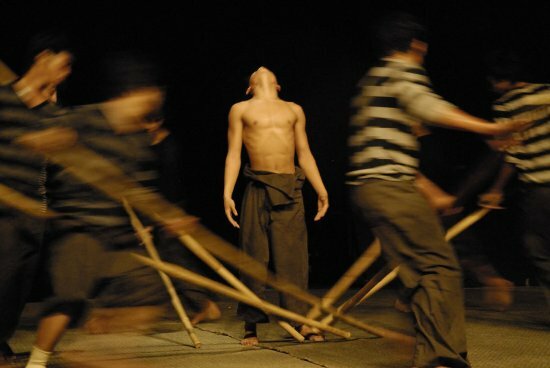 I won't describe it, but it turns back in a sense to the opening image of the piece: of one of the boys, very darkly lit, picking up lengths of bamboo from the floor, tucking them under arms, balancing them on shoulders, crouching very low, careful and upright to pick up each new stave. By the end his thin body stands at the intersection of these cutting lines, appearing like the multiply impaled figure of a tapestry or wood cutting — a figure from the past, held in place.